The simulation demonstrates the calculation of the unit circle circumference with the algorithm invented by Archimedes (287 − 221 BC). A regular polygon is inscribed to the circle, a second one is circumscribed. The circumference of the polygons can be calculated on basis of the Pythagoras theorem of rectangular triangles. The rest of the algorithm consists in drawing second roots, an art well known at that time. The present simulation starts with squares (order n = 2, corners N = 2n = 4). A switch n+1 increases the order in steps of 1 from n = 2 to n = 12 . With increasing number of corners both polygons approach the circle quite quickly, and hence each other, too. Already the 32-polygons are difficult to distinguish visually. The Reset button restores n = 2. At the top of the windows 3 number fields show the circumference of the inscribed polygon (blue), the value (2π) of the unit circle (black), and the circumference of the circumscribed polygon (red). For n = 12 (N = 4096) they differ in the 6th decimal . Knowing the triangle sides, it is easy to calculate the area of the triangles and as limit the area of the circle (πr2), with π for the unit circle. Independent of the practical importance of a systematic calculation of π the algorithm of Archimedes is a big step forward in the basics of mathematics. It is the first documented perception of convergent infinite series and their limit value (limit). Already in about 450 BC the presocratic philosopher Zenon of Elea theorized deeply about infinite divisibility of space and time. In this context he perplexed his contemporaries with famous Paradoxa. In the example of Achilles and the turtle the fast racer Achilles competes with a turtle that has an advance at the start. While he reaches its starting point, the turtle has again gained an advance. One can continue this reasoning ad infinitum, resulting in the conclusion that Achilles can never reach the turtle. Interpreted in today´s mathematical understanding, the issue of the paradox is: can a series of infinite steps, none of which is zero, lead to a finite sum (the point or the time of reaching the turtle). At the time of Zenon number theory did not include such a possibility. Archimedes introduces the transcendental circle number as finite limit value of an infinite series, and he invents a straightforward algorithm for its calculation. The members of this series are the products of the side length of a triangle and of the number of triangles in the circle. The limit value is the product of the limit of the side length (→0) and the limit of the number of triangles (→∞). In the case of Archimedes and the circle, the mathematical formula of the series members is rather complicated, as square root of sqare root of square root...with always the same argument − which renders it beautifully symmetric. In Zenon´s Achilles Paradox the formula is much simpler, as the limiting value of a geometric series. Archimedes´ algorithm includes its own proof by using 2 series that obviously converge to the same limit, an upper sum (external polygon) that is always larger than the limit and a lower sum (internal polygon) that is always smaller than the limit − for a finite order of the polygons. The relation of the members of upper and lower sum has a simple geometric meaning, with the half angle as the decisive parameter. E1: Increase the order n step by step and observe the improving approximation of the circle by the polygons, and of the polygon circumference to 2π (number fields). E2: Choose n =2 and then n = 3. 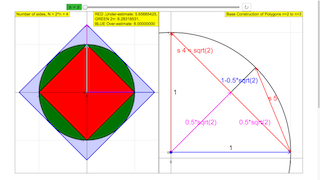 Look at the construction window, and derive the formulas for the partial triangles of the square and the octagon. From this derive the formulas for the circumferences. E3: Generalize your derivation to the n- polygon. Compare your formula with that of the Description page. E4: Now derive the construction and the formula for the circumscribed square, octagon and n- polygon. E5: Reproduce Archimedes´ historical way by starting with a triangle instead of a square. E6: Derive formulas for the approximative calculation of the area of the partial triangles, and hence of the area of the circle. This file was created by Dieter Roess in February 2010. This simulation allows you to change the number n with a slider, where the regular polygon used to approximate 2π has 2^n sides. The graph on the left shows the graphical approximation, and the top right corner shows the lower bound, upper bound, and the actual value of 2π (correct to 9 digits). The graph on the right shows how the polygon is constructed from n = 2 to n = 3 using Pythagoras' Theorem.